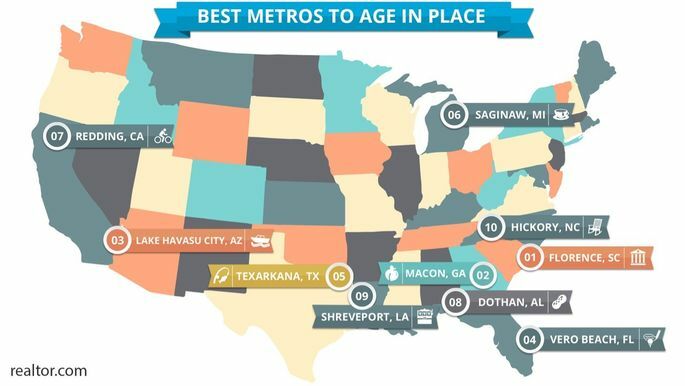 Macon was just named one of the 10 best cities in America to age in place. According to Realtor.com "There are about 75 million baby boomers growing a little older every day. They're the largest generation ever to retire, whenever they get around to it. And following right behind are 65 million Gen-Xers, the oldest of whom are already well into their 50s. They're all going to need places to live as they age...We figured out the best metros for middle-agers who may just be starting to slow down—or, now that the kids are gone, just starting to rev up." To actuate the leading places to age in place Realtor.com "took the 300 largest metros and evaluated them for affordability and health services, and then made sure these were locations people would really want to spend their golden years. To ensure geographic diversity, we limited the list to one per state." -Number of homes already adapted for seniors, looking at realtor.com listings with keywords like "universal design," "ground-floor master suite," "senior-friendly," and "no-step entry"